Hello wonderful readers, What’s the latest and newest with APASA? 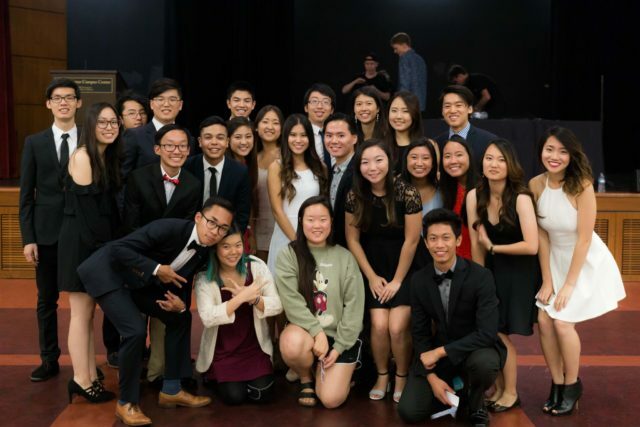 Last week, APASA had one of their signature events, Winter Formal! The theme this year was Red Carpet, and everyone came decked out in their most stylish suits and gowns. TCC Ballroom had never seen so much glamour and so many star-quality people. The night started with a walk down the red carpet, and after, guests were given the VIP treatment. There were never-ending free snacks including sushi, popcorn, and Herbert’s Lemonade. 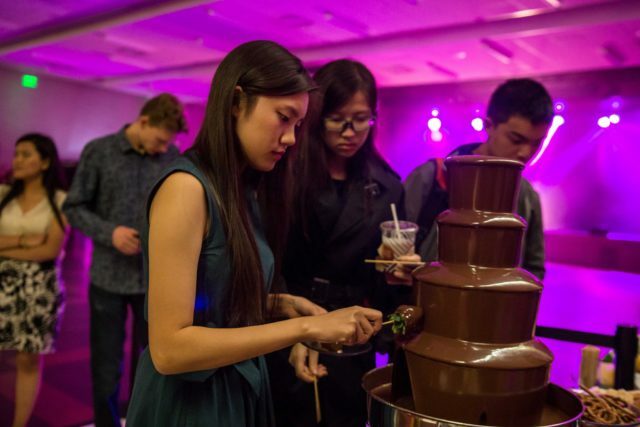 The bountiful chocolate fountain was also a big hit with party-goers. To compliment the snacks were fancy mocktails, which included exciting drinks such as Shirley Temple, Mockmosa, and Orange Berry Sunrise. Guests then had a mini photo-shoot with polaroids provided by SEC and photobooth pictures provided by QUASA and WSA. People also danced the night away to jams spun by the live DJ. It was certainly fun to watch glamorously dressed people bust out their favorite moves. This collaboration event between APASA and all the different assemblies was a great last big event to cap off the semester. Attendees donned their most fabulous outfits and danced away the stress of school. Overall, a great time was had by all. Hello Trojans! With midterms wrapping up and the temperature cooling down everywhere except for LA, we all know what time of year is approaching—holiday season! And finals… but before we face the dreadful end of the semester, we have Thanksgiving to look forward to. Vegetable and Noodle Salad with Ponzu Dressing: https://food52.com/recipes/36777-cold-vegetable-and-noodle-salad-with-ponzu-dressing Happy holidays! Hello everyone! This past Friday night, we hosted our 2016 APASA-ISA Alumni Mixer with the International Student Assembly at The Forum. Our current students had the opportunities to expand their networks, learn and gain mentorship from experienced alumni, and explore the possibilities in a variety of professional fields. I was thrilled to work on this event alongside Russell Ng, Vice President of Professional Affairs at ISA, as we featured alumni from a diverse range of fields, such as dentistry, consulting, asset management, and auditing to name a few. We also had several alumni who are currently challenging the underrepresentation of Asian Americans in the media and entertainment industry at companies such as Lionsgate. I am passionate about diversity and cultural awareness in the workplace, especially in entertainment. As a research assistant at Annenberg’s Media, Diversity, and Social Change Initiative, whose research investigation examines portrayals of race and gender in media to uncover the truths behind inclusion in entertainment, I quantify data, code content, and perform reliability diagnostics. Earlier this year, we published our findings of over 11,100 characters across 414 movies, television shows, and digital series. Media content plays a crucial role in how people form and view stereotypes in the real world, and our report highlights the staggering lack of diversity in the entertainment industry. Only 2% of all characters were coded lesbian, gay, or transgender, and female characters fill only 28.7% of all speaking roles in film. At least half of all cinematic, television, or streaming stories fail to portray one Asian or Asian American onscreen. We structured this mixer in a way for each alum to be seated with a group of students, and all of the alumni would then rotate and switch tables to meet and engage with all of the attendees. This was an amazing opportunity to show our current students where our alumni have developed and furthered their careers with purpose, and we are glad to have created an inclusive space for insightful conversations, growth, and empowerment. Thank you to everyone who came out to join us! We have many more events coming up throughout the school year, and we look forward to seeing you all there. I aim to continue opening doors to celebrate diversity and further cultural awareness, and I hope you all can join me in this exciting journey. Fight on!